Fifth Degree is a free MIDI sequencer iOS app developed for the 2014 KVR Developer Challenge. It does not make sound on its own. By default it sends MIDI notes on its own virtual interface; other apps can listen on that interface and play the notes. If you are new to MIDI or MIDI apps on iOS, you may wish to read this step-by-step tutorial before reading more about Fifth Degree itself. You can configure Fifth Degree to send MIDI notes to any additional physical and network MIDI interfaces. You can also synchronise timing between apps and other hardware by choosing where to send MIDI clock. Fifth Degree aims to be a simple but playable source of MIDI notes for looping, jamming, experimenting but especially post-processing. Its underlying philosophy is that from a few simple elements complexity can arise. Flexibility is great and has its place, but sometimes it can be liberating to work to a set of constraints. The main constraint in Fifth Degree is that it sends out a fixed sequence of MIDI notes, stepping through the circle of fifths in the key and mode / scale you choose. Fifth Degree keeps the essential performance controls on the main screen. 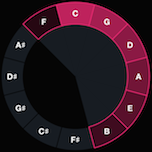 The main element of the app is a circular display of the twelve notes in an octave, arranged clockwise in ascending fifths. Only seven notes are in-key. They are displayed in decreasing brightness with the root note for the key being the brightest. Depending on the mode / scale you have selected, the root note is not necessarily the first note in the coloured arc of in-key notes. You choose the key to play in by tapping on the segment containing the root note, and you can choose from a list of classical modes to slightly change the feel of the sequence. The range of octaves to play. Playing seven notes ascending by fifths (with one flattened fifth to remain in key) spans around four octaves. Typically it is more pleasing for a melody to span a smaller range, so the octave range selection forces the octaves the notes are played in to be wrapped around closer to the root octave. Per step note velocities, where a velocity step of zero doesn't actually mean the corresponding note is silent, rather it introduces a pause for that step. This provides a way to change the rhythmic emphasis whilst still using all seven notes of the key. A tempo slider, for which you choose different minimum and maximum tempos via the settings screen. A note length slider, again which can be configured via the settings screen. The tempo range settings view offers a range of slow to fast minimum and maximum tempos in narrow to wide ranges. These make the tempo slider more or less sensitive. The note length range settings view allows you to choose from as short as a 64th note to three whole notes. The very shortest settings will not necessarily be workable with some synth patches, but may yet still have interesting effects. The MIDI view allows you to choose the CoreMIDI output ports that Fifth Degree will send notes to. It will send notes to all the ports you select. You can choose from Fifth Degree's own virtual output port plus any network and physical ports present. The MIDI view also allows you to choose the CoreMIDI output ports that Fifth Degree will send MIDI clock to. It will send MIDI clock to all the ports you select. You can choose from any network and physical ports plus the virtual ports provided by other apps. This is useful for synchronising to other sequencing apps and synths with tempo-synced parameters. Fifth Degree will continue to send MIDI notes if it is sent to the background while playing. This allows you to tweak the performance controls of your sound generating apps while it is running and sending them notes. Note that apps vary in their own support for running in the background and interoperability with other backgrounded apps. Here are some solutions to possible problems you may encounter using Fifth Degree. In particular, interoperability between iOS apps is relatively new territory. Fifth Degree doesn't make any sound when I tap the Play button: Fifth Degree is a MIDI sequencer; it doesn't make any sound on its own. You need to configure a sound generating app that uses CoreMIDI to listen to MIDI events. An free example of such an app is Novation's LaunchKey. You can post any further support questions in the Fifth Degree thread on the KVR DC Chat forum.